Uh huh, I told you it was retro! Not even Handsome Man can protect your eyes from the horror! As much love as it has received in the last 30 years, it is starting to show its age. The doors are chipboard, and are starting to come apart at the bottom. 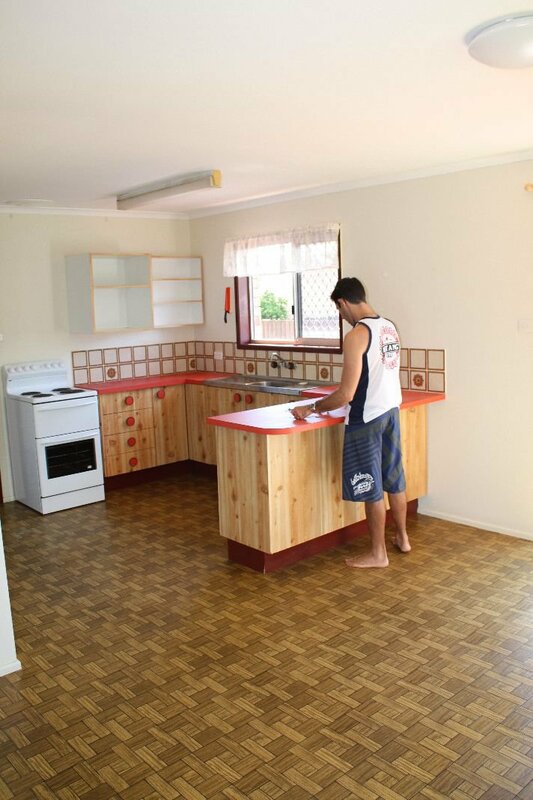 The stove is open on one side as well as the front, which is a safety hazard for the little man, and there is no space for a dishwasher, which is an issue given we have very narrow benches and a single sink. When I was in the pointy end of my labour with the little man, I was very forceful in my refusal do ever do the washing up, ever again. A dishwasher is definitely a high priority. The time has come to update, and I have some ideas, but there’s no way I’ve thought of everything. So, for those of you who have survived a kitchen renovation, which are your hints, tips, lessons learned ,etc? How can we ensure we get the best kitchen we can?